By Chris Williams: WBO welterweight champion Tim Bradley (31-0, 12 KO’s) will be making a $6 million guaranteed purse for his rematch with Manny Pacquiao (55-5-2, 38 KO’s) on April 12th at the MGM Grand in Las Vegas, Nevada. It looks Bradley caved in on the $10 million that he was reportedly asking for to fight Pacquiao a second time. Pacquiao will be getting $20 million. 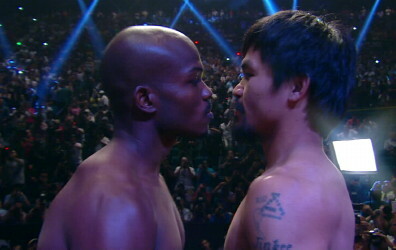 Bradley beat Pacquiao by a controversial split decision the last time they fought in 2012. The outcome was so controversial that it takes away a lot of the interest in the rematch, because it’s a fight that really isn’t necessary. Pacquiao already beat Bradley. Boxing fans might not like the idea of having to pay to see an unnecessary rematch. If it were a free fight then fans wouldn’t care too much, but the fact is they’re having to pay again. It’s like watching Roy Jones Jr. fight Montell Griffin a second time when he had totally dominated him in the first fight before being disqualified when he hit Griffin after he had taken a knee. It’s also possible that Bradley had to re-sign with Top Rank to get the fight, as Top Rank president Todd duBoef said that Top Rank “has a long-term relationship with Tim regardless of whether he wins or loses,” in the fight, according to Yahoo. I don’t know about you, but this sounds to me like Bradley re-signed with Top Rank in order to get the fight with Pacquiao. If that’s the case then Bradley can kiss goodbye any chance of him ever getting a fight against Floyd Mayweather Jr. while he’s with Top Rank, because Mayweather won’t agree to that fight. Bradley has mentioned wanting to fight Mayweather on many occasions, but he shouldn’t bother wasting his time talking about the fight if has re-signed. It probably doesn’t matter anyway, because if Bradley loses badly to Pacquiao on April 12th in the rematch, then Bradley’s better off staying with Top Rank than leaving them. By staying with Top Rank, Bradley will have a chance to fight Pacquiao a third, fourth and fifth time given that Bob Arum doesn’t have a lot of options for Pacquiao to fight. But if Bradley were to leave the company of of the back of a defeat to Pacquiao, then he won’t get the Mayweather fight, and he’d be picked apart by Golden Boy Promotions fighters like Keith Thurman and Danny Garcia.